What's the best game you ever received as a holiday gift? Tell us your holiday memories. The holidays are upon us, and so we have a matching weekend question to ask: what's the best game you ever received as a holiday gift? Below you'll find our answers, which shed some light on our experiences with games when we were younger. Regular readers of the PCG Q&A won't be entirely surprised to learn that the answers mainly mention games from the '90s, such is the general age bracket of our team. We'd love to read about past gifts you received during the holidays. Let us know your answers in the comments below. A long time ago I got Tomb Raider 2 as a Christmas gift. It came in a great big brown box with Lara Croft on it, and I still remember how exciting it was to load it up for the first time. The underwater bits were scary, the speedboat bit in Venice was a surprising James Bond moment, and no matter how hard I tried I couldn't kill the butler. It's hard to go back and enjoy it now, but at the time it seemed like a Christmas miracle. Sometimes I get the menu music stuck in my head and remember the game all over again. Thanks for the memories, Eidos. I'm cheating here a bit because I don't think it was actually a holiday gift, but my dad once came back from a business trip with a copy of Tomb Raider for me, in that legendary trapezoid box. I can still see it hidden in his sock drawer where I found it as a snoopy kid. Maybe it was going to be a birthday present? I can't remember exactly, but I do remember the pounding in my heart when I found it, and the whoa moment I felt when I later played the game and pressed a key to swap between its graphics presets. The "high" graphics looked so real. What an experience that first eerie cave was. Footprints in the snow! Wolves! It was beyond what I imagined. Off the topic of PC games, I'd give a special nod to an uncle for giving me Pikmin for Christmas 2001, after I'd spent all summer saving up for a GameCube. I was obsessed with Smash Bros. and Rogue Squadron 2, but Pikmin hadn't even been on my radar. I ended up loving it. I'd also like to mention that the worst game I've ever gotten as a holiday gift was Glover. I would've had more fun with a can full of rocks. For Christmas 1998, I got all the Star Wars things. It was all I cared about. My family bought me the films on VHS, which is the first time I ever owned them—that was a huge deal. But they also bought me two games that I probably played more than anything else in the '90s: Rogue Squadron and Shadow of the Empire. The latter is considered something of a dud, but it has a great version of the Battle of Hoth, plus it lets you run around Echo Base fighting Wampas. 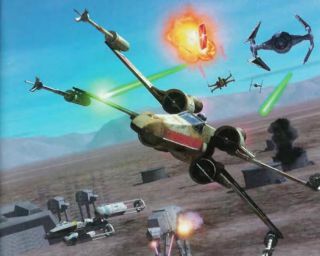 Rogue Squadron, though, despite being so difficult that it took me a while to rattle through its levels, was a top arcade-style shooter. I think it's best remembered as an N64 game these days, but I only ever played it on PC—you can get it on GOG now, and it works perfectly with an Xbox controller. Why didn't they ever release the sequels on PC, eh? My parents didn't really buy me PC games as holiday gifts when I was a kid. I got a lot of educational games randomly throughout the year, and some of my dad's old games when he was tired of them, but as far as holiday gifts go, I got clothes, dolls, and the occasional Ninja Turtle action figure. The only two games I am positive I received as a holiday gift are Banjo Kazooie (which was for the N64, so that kind of doesn't count), and Vampire the Masquerade: Bloodlines. They never bought me a game after that one, so I guess by default VTM: Bloodlines is the best PC game I ever received as a holiday gift. Rave eJay, and later HipHop eJay. Both were simple music creation programs—often found in the bargain bins of UK game stores—that let you position pre-made riffs and beats to create your own tunes. Playing with them as a '90s teen, I think I managed to convince myself I had a natural talent for assembling banging tunes. I even made a mixtape containing my greatest hits—the highlight of which featured a friend who I'd recorded rapping down the phone. (Rural Warwickshire is not traditionally known for its hip hop scene.) For whatever reason I never did break into the music business. Probably because all of the tracks made with it basically sound the same. It could have been a birthday present rather than a Christmas present, but since I can’t even remember what I got last Christmas, let alone all of them, let’s just pretend that a pre-teen Fraser was delighted when he unwrapped Civilization 2 on Christmas morning. I’d played some turn-based strategy games before, but the first Civ sequel is probably where I really started obsessing over maps and armies. I was already a burgeoning history nerd, so to have the history of civilisation laid out before me, even in this really abstract way, was incredible. Last year, I got to chart the history of the whole series with the help of each lead developer. There’s no way that the 11-year-old locked in a war with his dreaded Aztec nemesis would have believed that he’d be chatting about the very same game with Sid Meier and Brian Reynolds over 20 years later. What a trip. I don’t know if I could pick my favourite Civ—it would probably be 4 or after—but the second game has a fixed place in my heart. I was a huge fan of Dungeons and Dragons growing up—I can't believe I gave away all of my old manuals as a teenager. "First Edition Monster Manual, Player's Handbook, Dungeon Master Guide, Deities and Demigods? Those are old and couldn't possibly be worth keeping..." Anyway, the point is I loved playing D&D games of all forms, and in 1998 BioWare revitalized the RPG genre with Baldur's Gate. I'm fudging a little on this and calling it a gift, but it was one of the few games I preordered and it arrived at the perfect time: right as finals wrapped up and winter break started. I binged hard, beating the game twice in a two week period. I remember my roommates knocking on my bedroom door probably the second morning after I got the game. "Hey, Jarred, you all right in there? We haven't seen you since yesterday." Me: "Go away, I'm busy." Sleep was a chore, and I played 30 hours straight after installing Buldur's Gate. After the decline of SSI's D&D games, Buldur's Gate was the perfect RPG at the time. In fact, I think its sequel and the Neverwinter Nights games were the last great D&D titles. Maybe it's time for someone new to pick up that torch. I've never recieved a game as a gift. They were banned from my household growing up. Tragic, I know. I've bought myself a ton of games though, including but not limited to Mario.